As the morning sun caressed the lush green pitch of Bradman Oval, it created an atmosphere of quiet grandeur and timelessness. 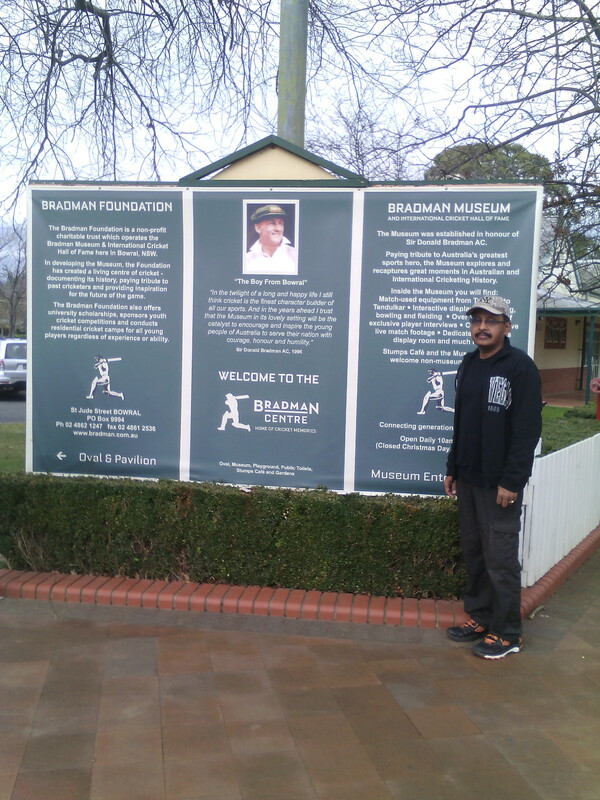 Here in Bowral, cricket’s ultimate place of pilgrimage, all-time great and legend Sir Donald George Bradman (1908-2001) spent most of his cricketing years! 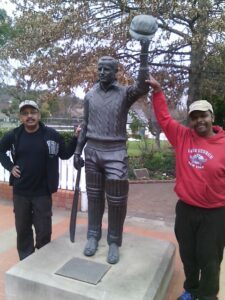 This is the ground where Sir Don scored his first century in Grade Cricket. Just 115 km south-west of Sydney, Bowral is the largest town in the Southern Highlands of New South Wales and the main business precinct of Wingecarribee Shire and Highlands. 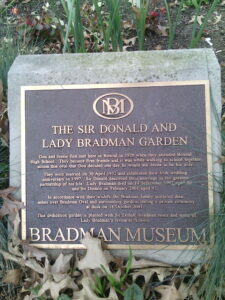 Bowral used to be a rural retreat for the elite gentry of Sydney just as The Hamptons was for wealthy New Yorkers. 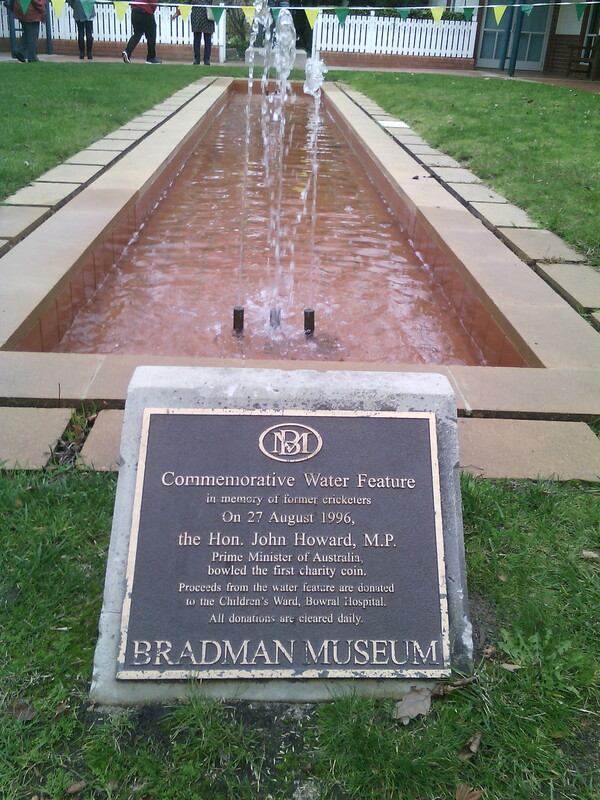 Today, Bowral is well-known for Bradman, the legend who with a resolute mind and dreamful eyes wielded his willow for hours here. His ashes were scattered on this field. It was his wish. He wanted to come home. The name ‘Bowral’ is believed to be derived from the Aboriginal word ‘Bowrel’ which loosely translates into the word ‘high’. 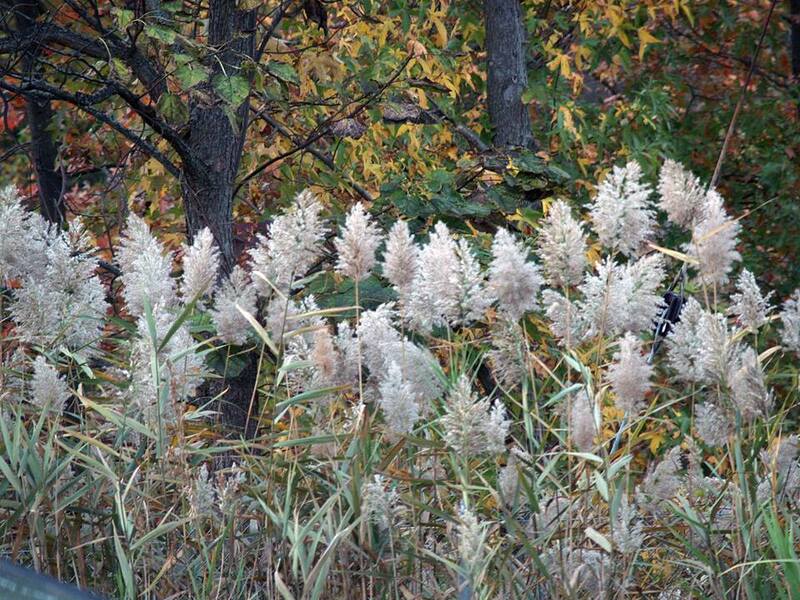 This wasn’t a permanent setting for Indigenous people, as the region’s climate was too cold. I took a train from Sydney Central station. A friend of mine was waiting at Leumeah rail station (57 minutes journey from Sydney Central) to receive us. The double-decker train reached Leumeah, a suburb of Campbelltown, right on time. From the station my friend drove us to his house which has a spectacular garden at the backyard. We were greeted by his wife who was waiting at the doorstep. We had coffee and biscuits (I fell in love with Arnott’s biscuits during my stay Down Under). Words fail to describe their warmth and hospitality, even though we were there for a very short time. My friend’s son drove us to the Bradman Museum. In another car, his wife was driving with Soma and Jishu. It was very cold even around noon time. The journey from Leumeah to Bowral was truly memorable as we passed by sylvan woodland on either side of the roads. Driving through the picturesque countryside and watching Nature in its pristine glory was amazing. It took almost an hour to reach Bradman Museum. Nestled at the base of Mount Gibraltar, Bowral is known for its country gardens and fields of tulips in spring. Stunning private gardens, part of grand old estates, are a delight. 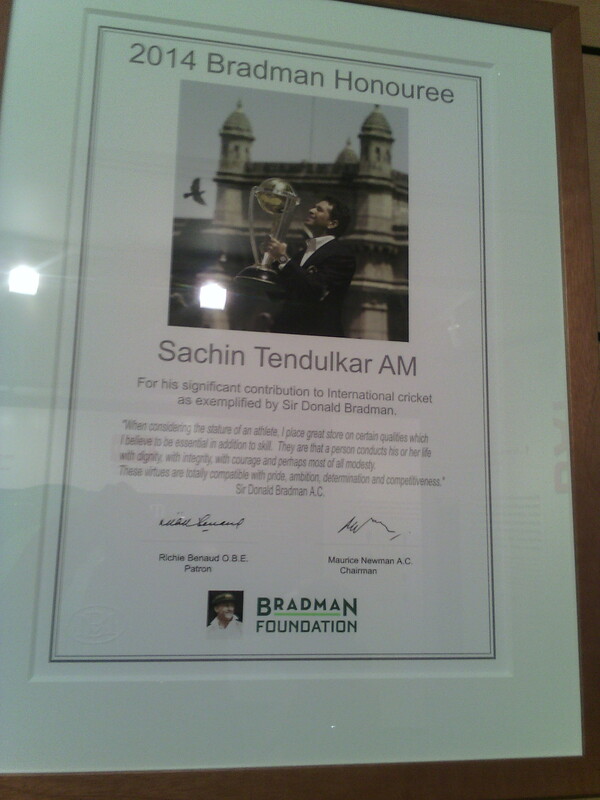 The Bradman Foundation owns and operates the Bradman Museum and the International Cricket Hall of Fame (ICHF). 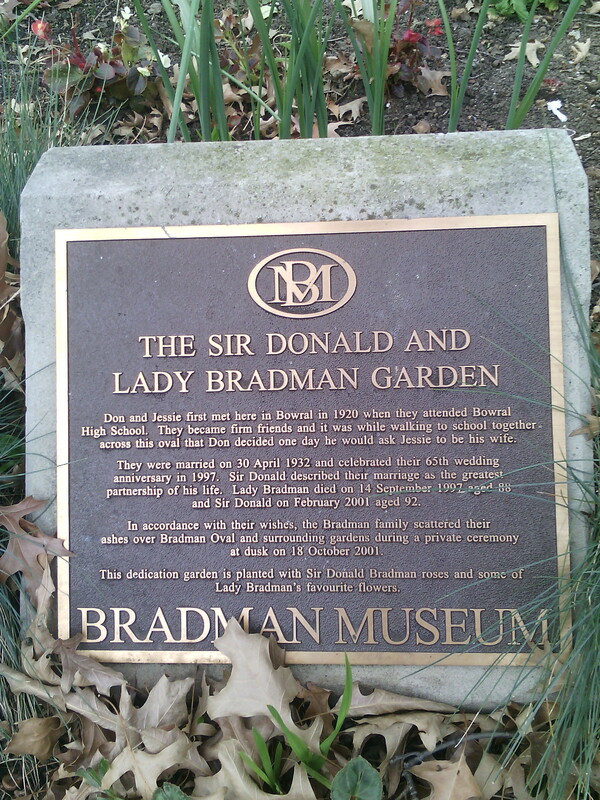 The ICHF is located next to the beautiful Bradman Oval, the very same ground where young Donald honed his skills that made him the greatest batsman the world has ever seen. The Museum takes visitors on a fantastic journey, reliving great moments with rare film footage, photos and wonderful memorabilia: the caps and the blazer, the life-size portraits, and the picture of the 1948 Australian cricket team better known as “Bradman’s invincibles”. The Museum comprises five major exhibition galleries, hundred-seat theatre, plus a second theatre, library, children’s area, souvenir, gift shop and Stumps Tea Room. Daily screenings in the theatre highlight cricket newsreel footage from the first half of the twentieth century followed by an expose on Bodyline. One of the Foundation’s objectives is to continue to develop the Museum as an enduring repository of cricket history by conserving, acquiring, researching and exhibiting relevant objects, photographs, film and audio that engage a global audience in the history of the game. As we stepped into the museum, the elderly lady at the reception told: “The vision of the museum is to help people understand the game by collecting and using objects to interpret the past and present and explore the future.” The museum, unlike any other cricket experience in the world, uses the latest touch screen and interactive technology to entertain and inform tourists. “Visitors to the museum will come to know why cricket is so important to millions of people across the world,” said the lady. 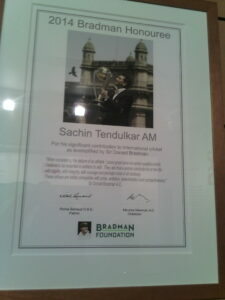 I saw two huge framed pictures of Sachin Tendulker and Rahul Dravid who have been honoured by the Bradman Foundation. 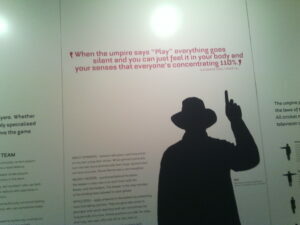 Many interesting information about Bradman and cricket was written and elegantly framed and kept hanging on the walls. The Foundation continues to honour the history and development of cricket worldwide and educate youth through the game and Bradman’s values of courage, honour, humility, integrity and determination. 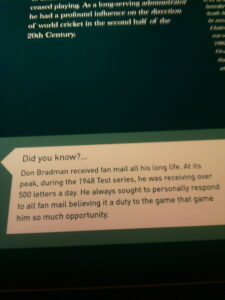 We saw Bradman’s very first bat that he used, his baggy green, and an interactive letter trail. 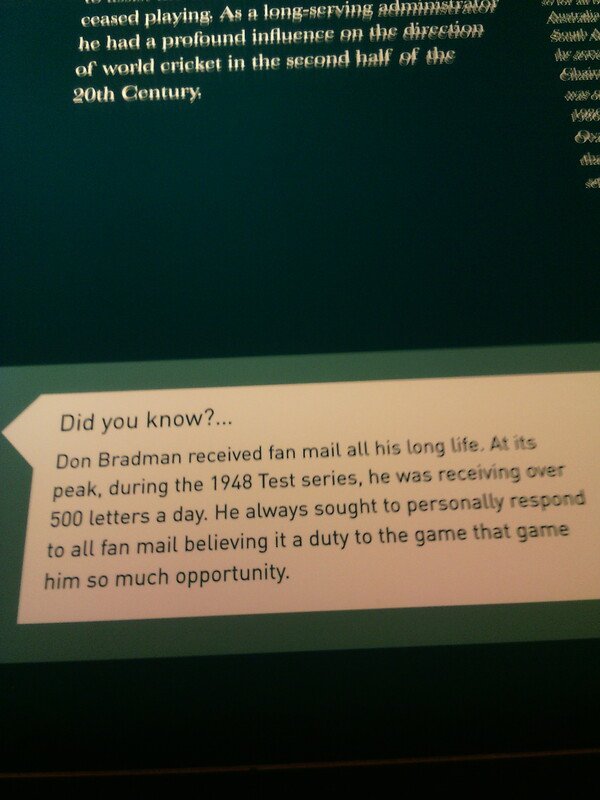 The section where the museum exhibits how Bradman trained himself by hitting a ball against water tank with a stump in his early days was amazing. Yes, generations will come and go, but people would hardly believe that such a cricketer has ever existed on this earth!